Packaging the only bumper that sportsmen trust to hold their rods and rifles. If you’re a keen sportsman, there are likely few things you hold more dear than your fishing rod or rifle, and of course your vehicle. While vehicles are great at getting you from point A to point B, their doors and bumpers aren’t the most reliable way to keep your rod or rifle resting securely. And who hasn’t had a rod fall over only to leave a nasty scratch in your paint job? The Sportsman Bumper is the perfect solution. The bumper magnetically affixes to your car of truck door, securely holding your gear in one place without contacting your pristine paint job. Through our work with the Colorado Original Outdoor Products (COOP) collective, it quickly became apparent to us that the Sportsman Bumper would be one of those pieces of gear that is impossible to live without. When we were asked to develop a packaging solution that prominently featured the product and made apparent it’s application in the field, well, let’s just say we our faces hurt from smiling. 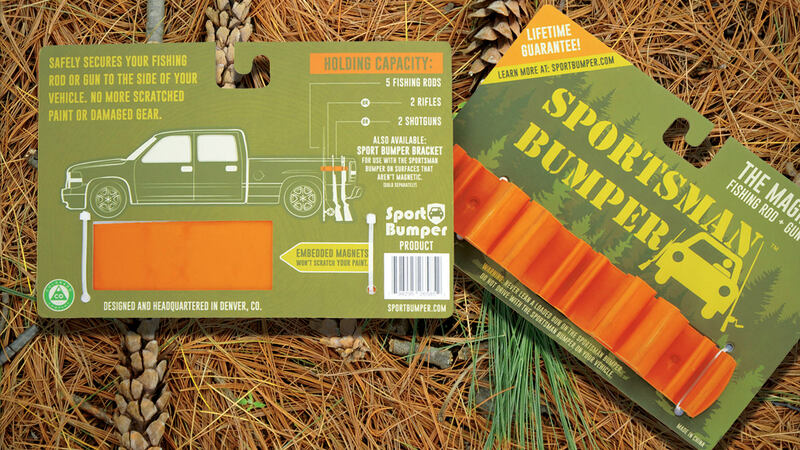 In designing the Sportsman Bumper packaging we paid great attention toward hierarchy of information, highlighting the fact that the bumper is a magnetic rod and gun rack with a lifetime warranty, as well as illustrating how the bumper works when stuck to the side of a truck. We also made sure to leave the product accessible so that potential buyers could test it in the retail environment. We still get excited when we see one of these on display at a local fly shop or, even better, when we pull up to a river and see one of these being used by a fellow outdoorsman.